Glitterati – Close up on me ! Background : RAMA – #selfie_RAMA Wedding Room . By Faullon @The Guardians Event! Background 1 : SecondSnaps Studio 3 v3.07 SOOOOO HELPFUL!! 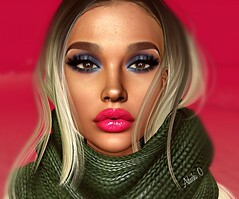 Lipstick : MIGNONNE – Talco Lips Hud for Logo . By Njam .